Some stuff from our inbox, to tide you over until the next update. From Nov. 18 through 22, WKSU Reporter/Producer Vivian Goodman will follow the internationally recognized Cleveland Orchestra as it completes its fall tour of European concert halls with performances in Cologne, Germany, and Linz and Vienna, Austria. Goodman began her reports with a Nov. 11 preview of the tour with Orchestra Music Director Franz Welser-Möst in which the Maestro discussed the repertoire and the program’s connection between Beethoven and Shostakovich. In Europe, especially culture-mad Vienna, Welser-Möst and the Cleveland Orchestra are treated like rock stars. By covering the group on the road, Goodman takes listeners backstage to connect with one of the world’s best classical music ensembles by featuring less formal interviews with the musicians and responses from audience members. She will also profile the cities and venues visited at the end of the Orchestra’s annual autumn tour. Goodman’s stories will air during WKSU’s local broadcasts of NPR’s “Morning Edition,” “Here and Now” and “All Things Considered.” She will capture audio during the day and produce reports in her hotel room with assistance from WKSU Music Director David Roden in Kent. Classical music host Mark Pennell also plans daily on-air chats with Goodman at 8 p.m. to let listeners hear additional details about the Orchestra’s European adventure. Along with audio reports, Goodman extends her coverage by posting images and blogs on WKSU.org. Content will be added on the New and Classical Music pages on the website. WKSU’s coverage of the Cleveland Orchestra in Europe is made possible in part through support from the Noble Foundation. WKSU is an award-winning public radio station and service of Kent State University that broadcasts to 22 counties in Northeast and North Central Ohio from the station’s primary signal at 89.7. WKSU content can also be heard over WKRW 89.3 (Wooster), WKRJ 91.5 (Dover/New Philadelphia), WKSV 89.1 (Thompson), WNRK 90.7 (Norwalk) and W239AZ 95.7 (Ashland). The station adds WKSU-2 Folk Alley, WKSU-3 The Classical Channel and WKSU-4 The News Channel over HD Radio and as streaming audio at http://www.wksu.org. SportsTime Ohio previously announced the return of the popular show, Beer Money, where contestants are asked sports trivia questions for the opportunity to win up to $130. The network is continuing production of the shows this week and will be seeking contestants starting at 7pm at three local bars this Thursday, Friday and Saturday. The shows will debut on SportsTime Ohio next Tuesday, November 19th at 6:30pm. 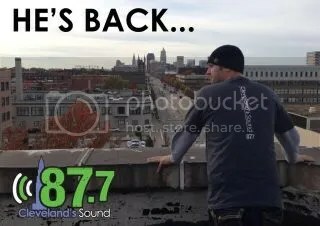 NEW CLEVELAND SOUND: The on-air deck is being shuffled at Murray Hill Broadcasting alt-rock/AAA WLFM-LP/87.7 “Cleveland’s Sound”, and the sound you won’t hear anymore is from the station’s original morning host. Berwick is a former CBS Radio Cleveland promotions staffer, who we’re told has been doing similar work with the New York Mets. As far as we know, though we could be wrong, Archie has no significant on-air experience. Berwick, known only by his first name Archie on the air and also known as “The Black Mr. Rogers”, was a curious fit for a station hoping to gain music-focused listeners set adrift by two stations: WKRK/92.3, the former alt-rock “Radio 92.3” (now sports “92.3 The Fan”), and the former AAA WNWV/107.3 “V107.3” (now smooth AC under Rubber City Radio Group, using its former identity of “107.3 The Wave”). Archie is out at the Agora, as the station brings in a high-profile Cleveland radio veteran. He’s Dan Stansbury, best known by his last name as a sidekick to former Clear Channel rock WMMS/100.7 afternoon drive host Maxwell. Maxwell’s band was broken up when Oak Tree didn’t renew his contract. The show resurfaced for basically a nanosecond in morning drive on CBS Radio classic rock WNCX/98.5. Stansbury will host “The Stansbury Show” in afternoon drive on WLFM, which displaces “Lyd the Kidd”. But she moves to morning drive (as “Lydia”), and the “Cleveland’s Sound” game of musical chairs means Mr. Berwick is standing up without a chair. The now-former 87.7 morning host took to Twitter to talk about his departure. And the new entrant in the Agora Radio Sweepstakes, Dan Stansbury, also had comments on social media. Maxwell’s current “thing” is as morning driver at still-Merlin Media rock WLUP/97.9 “The Loop” Chicago. The Chicago show is more music intensive, and doesn’t feature any of Maxwell’s Cleveland cast members. And of course, WMMS itself moved on to air “The Alan Cox Show” in afternoon drive…a move that was more than successful for them. And to tie this together, former “Alan Cox Show” co-host Chad Zumock will now be on the same station as Stansbury, with his Sunday night program on “87.7 Cleveland’s Sound”. KENNY ON THE FAN: We weren’t taking a lot of bets that former Good Karma sports WKNR/850 “ESPN Cleveland” evening-previously-afternoon drive host Kenny Roda would land on WKNR’s competitor, “92.3 The Fan”. While we still believe he won’t displace any of the station’s weekday hosts, Roda has indeed landed. What 92.3 midday hosts Andy Baskin and Jeff Phelps called “The Roda Moment” debuted Wednesday on the CBS Radio sports talker. You can hear the first segment here (dubbed “Roda Report”). Roda will appear on “Baskin and Phelps” each Wednesday at 12:40 PM to talk about a wide variety of sports topics. His first appearance Wednesday was via phone. The veteran host has not exactly let moss grow under his feet after Good Karma dumped him, Will Burge and T.J. Zuppe in what many believe was a salary dump by the Galleria. Roda appears (with Baskin) regularly on Scripps ABC affiliate WEWS/5’s Buckeye post-game coverage, and on the station’s “Dawgs on the Run” online video show…the show is seen on WEWS’ NewsNet5.com and on the WEWS mobile apps very early on Monday mornings. AS SUSPECTED, SAME FORMAT: We considered it somewhat likely that standards WHTX/1570 Warren would return to a former format under the control of former LMA operator/would-be buyer/future owner Nelson Cintron, and it looks like we won the easy bet. As it did when Cintron took over the station before, an OMW reader in the Mahoning Valley tells us that WHTX has returned to “its R&B format”. We don’t have to drive to the Valley to guess that Cintron’s Sagittarius Communications is likely using the 24/7 satellite format “The Touch”. In a legal settlement with now-former WHTX owner and OMW reader Chris Lash, Cintron also gained control of Whiplash Radio’s WYCL/1540 Niles, a daytimer that went off the air due to a host of technical problems. If Cintron is able to return 1540 to the air, we assume that station will also once again mount the Spanish-language “La Nueva Mia” format it had before. Our Valley reader tells us that after the WHTX format change, Jack Cory, long-time voice of standards WKTX/830 Cortland, thanked people for listening to “the number-one rated” nostalgia/easy listening station in “all of Northeast Ohio”. PARKS EXITS: We don’t really cover the Cincinnati market like we used to, but a veteran radio programmer based at Clear Channel talk WLW/700 there is out of a job. Darryl Parks used to program WLW directly, before he was prompted to Vice President of news/talk programming for the entire Clear Channel chain nationwide. Parks helped mold original “The Big One” into an even “Bigger One” in his time programming the 50,000 watt flamethrower at 700 in Southwest Ohio. Well, Parks did write a very controversial blog on the WLW site about the FCC’s plans to rehabilitate AM radio. There’s no confirmation connecting that with his dismissal by Clear Channel Media & Entertainment and Pork Rinds (the latter our own addition), and it could also just have been a budgetary move. We go into this because when we were trying to cover media statewide from our Northeast Ohio perch, we talked about Parks and WLW a lot. AND FINALLY…: The changes we’ve teased here are indeed coming, likely in the next week or two. Again, we aren’t returning to our earlier move of basically limiting the OMW presence to social media. One reason we’ve been almost “hiatus scarce” in recent days has been technical. But that’s about to change, and other changes will come to the Mighty Blog of Fun(tm) as a result. We don’t know why, but Loede recently exited “The Fan”. Though the 92.3 website doesn’t specifically list him as “Indians beat reporter” (or list him at all at this point), it appears that the opening will be filled by a former staffer of crosstown Good Karma sports WKNR/850-WWGK/1540 “ESPN Cleveland”. After studiously avoiding poaching the Galleria for talent at launch, WKRK has brought aboard another former WKNR personality – T.J. Zuppe, one of three staffers fired in a talent purge last August. Zuppe was most recently the Indians beat reporter at “ESPN Cleveland”, and was shown the door along with fellow staffers Will Burge and Cleveland sports talk veteran Kenny Roda in an apparent budget-related move. Zuppe joins former WKNR personality Chris Fedor on the “Fan” staff. Fedor has been doing weekend/fill-in sports update anchoring and occasional talk fill-in for 92.3. We don’t generally talk about ratings here, for various reasons, but a look at the most recent public Cleveland market ratings numbers shows that the folks in the Halle Building are probably celebrating “92.3 The Fan’s” most recent showing…it’s best as a sports talk station. SPEAKING OF THE HALLE: WKRK, and its CBS Radio clustermates, had a bit of a tense morning the other day. Early Friday morning, it was believed that a downtown Cleveland street shooting happened on the Huron Road side of the aforementioned Halle Building, giving CBS Radio staffers a view of a lot of police activity. Two men were shot in the 1200 block of Prospect Avenue by an unknown gunman. After being shot, the two victims ran to the area of E. 12th and Huron Road, and took a taxi to MetroHealth Medical Center, where they are being treated for non-life-threatening injuries. NEW CO-HOST IN AKRON: We told you, back when local radio veteran Tony McGinty moved from the morning producer role at Rubber City Radio’s news/oldies/sports WAKR/1590 to a similar role at Clear Channel CHR WKDD/98.1, that a third, female voice would join him alongside WKDD’s Keith Kennedy. That woman has now started at Freedom Avenue. DAVE HAS A PARTNER: “27 First News” in Youngstown, seen on LIN TV’s CBS-Fox combo of WKBN-TV/27 and WYFX-LD/19, has a new evening co-anchor. A quick Google search places her as the now-former evening co-anchor for “Siouxland News”, on CBS affiliate KMEG/14-Fox affiliate KPTH/44, a combo operated by Sinclair. A goodbye video on her YouTube page is dated May 31 of this year. Thomas shares many other videos of her previous work on her own website. “We are extremely pleased to have a journalist of Erika’s caliber joining our news operation. Erika’s passion for news is a very welcome addition to our news team, her skills will only enhance our ability to provide our local viewers the very best in news coverage each and every day,” said Dave Coy, President and General Manager of WKBN and its sister stations. VALLEY STATIONS CHANGE HANDS: Continuing the Mahoning Valley theme, two radio stations in the Youngstown-Warren radio market are in new hands. Or old “new hands”. Former Cleveland city councilman Nelson Cintron Jr. filed to purchase Whiplash Radio’s WHTX/1570 Warren and WYCL/1540 Niles – under his Sagittarius Communications – in October of last year. It’s a deal the FCC blessed with approval two months later. But Cintron, who immediately LMAed the stations and flipped formats (WHTX to urban adult contemporary using the syndicated “The Touch”, and WYCL becoming Spanish-language “La Nueva Mia”), never actually took ownership of either station. By May, 1540 had returned to owner Chris Lash’s “The Farm” classic country format, and 1570 returned to standards as “Fabulous 1570”. The stations are now returning to Cintron, in what’s being called a court settlement. Cintron sued Lash and his Whiplash Radio, LLC over the transaction, in a suit we found in Trumbull County Common Pleas Court. The settlement has not yet made it to online court records. Lash has been living in Florida in the last part of his ownership of the two local stations, and still operates stations in Kansas, Colorado, and Nebraska (a non-commercial trio running his “Cat Country” format) and two commercial stations in Tenneesee. ANN’S CORNER: We’re overdue for this item from “Ann’s Corner”, a regular feature with items brought to us by (all together, now!) long-time personal and professional Friend of OMW Ann VerWiebe, public relations/marketing guru for Kent State University public radio outlet WKSU/89.7-and-its-many-simulcasters. WKSU Assistant News Director Amanda Rabinowitz was presented a prestigious National Murrow Award from Radio-Television-Digital News Association (RTDNA) at an Oct. 14 ceremony at the Times Square Marriott Marquis in New York, N.Y. The award was presented by ESPN investigative reporter T.J. Quinn during the live-streamed formal event. The winning entry previously won a Regional Murrow, competing against work from large market radio stations in Ohio, Indiana, Illinois and Michigan. Rabinowitz was honored for Best Sports Reporting for an in-depth report on the misuse of prescription painkillers by college athletes. MIKE O’S CORNER: And here are some items from another Friend of OMW, long-time Cleveland radio type Mike Olszewski. Mike tells us about a benefit for Sonny Geraci, who was lead singer for the popular Cleveland-based group “The Outsiders” and later, for “Climax”. Tickets start at $35 per person each day, and can be bought online. DR. GONE: Scripps ABC affiliate WEWS/5 made a big deal out of its choice to replace Oprah Winfrey at 4 PM, when the queen of TV talk left the over-air airwaves for her own “OWN” – “Oprah Winfrey Network”. Dr. Mehmet Oz from the Oprah Universe, who had already been airing on WEWS at 10 AM weekdays, would air also at 4…with the later edition being his “newest” show, and the 10 AM airing a repeat from a week earlier. “Dr. Oz” is no longer practicing TV medicine on Channel 5 at 4 PM, in an abrupt move made a while back. We noticed it when we turned to WEWS a couple of weeks ago, and found two airings of the half-hour video clip show “RightThisMinute”. The show has aired at various times on Channel 5 in the past. Why so abrupt a change? Maybe the folks at 3001 Euclid were tired of “Dr. Oz”‘s sagging ratings, and for that matter, were worried about its effect on NewsChannel 5’s “Live on Five” at 5 PM…a show that we hear has definitely seen better ratings days. You could well say the same for the station’s “Good Morning Cleveland”. As the folks at 3001 Euclid are fond of doing, “Live on Five” has undergone tweaking…that apparently isn’t helping the ratings. Also aboard the new “Wave” is Grace Roberts, who started her career at the station (under Elyria-Lorain Broadcasting ownership, of course), and eventually became a mainstay at Radio One urban AC WZAK/93.1 and gospel WJMO/1300. There was only one problem with our item. Despite the fact that Rubber City even added Grace to its new website, she never actually took the job at WNWV…choosing, we heard later, to stay with Radio One instead. It turns out the announcement of Grace joining the Wave was about a year and nine months premature, as Roberts does indeed now join the “107.3 The Wave” staff…really. RUBBER CITY RADIO GROUP Smooth AC WNWV (107.3 THE WAVE) has named GRACE ROBERTS as its new Community Affairs Director. ROBERTS will also join the WAVE MORNING SHOW team, with longtime host DAN DEELY beginning OCTOBER 28th. Roberts tells the AllAccess folks that she’s followed Deely’s career over the years, and says it’s an honor to be working with him. NEW WKSU PD: Kent State University public outlet WKSU/89.7-and-its-many-simulcasters has named a new program director. She’s Ele Ellis, who comes to the Kent-based station from WUGA in Athens GA. Yes, “even folk music”, as Ellis rose from show host to program director of AAA/Americana/variety WNCW in Spindale NC. She hosted the bluegrass program “Goin’ Across The Mountain”. WNCW is well-known in public radio circles for its music, and covers a wide swath of the Asheville NC and western North Carolina area, with translators in Charlotte and other cities. THIS IS NPR: If you spend even a little time listening to WKSU and other NPR stations, you probably can hear the voice in your head…”This is NPR”, which used to be followed by “National Public Radio”. That voice was Frank Tavares, who intoned the above and read thousands of underwriting announcements from his Connecticut home for three decades. The public radio giant announced this week that a female voice will replace Tavares on the air, Sabrina Farhi. From NPR’s press release, quoted on Jim Romenesko’s site. Listeners will begin to hear Farhi’s own articulation of “Support for NPR comes from…” in November, as she reminds audiences of the multitude of Member stations, corporations and institutions who contribute funding to NPR and public radio. Joe Gunderman, a production coordinator at WKSU in Kent, Ohio, and an announcer of NPR’s digital sponsorship credits, will also be replaced. Gunderman and Tavares were invited to apply for the new position, according to NPR. AND ONE MORE ON WKSU: And believe it or not, this one didn’t come from (see above). We were stumbling across the FCC databases tonight when we found an application earlier this year for a WKSU translator in Mansfield. The 22 watt signal at 95.1 would not be a powerhouse, but would restore NPR news/talk programming to much of Mansfield that lost it when Ohio State University’s WOSU-FM decided to mount the station’s all-classical service (based at newly acquired WOSA/101.1 “Classical 101” Grove City/Columbus) on WOSV in that Mid-Ohio city. The proposed Mansfield translator lists WKSU’s nearest full-power repeater signal, WKRW/89.3 Wooster, as its intended primary. WKSU also operates 80 watt W239AZ/95.7 in Ashland, another translator that doesn’t made it to the heart of Mansfield. DARREN TOMS EXITS OAK TREE: Clear Channel talk WTAM/1100 Cleveland news director Darren Toms is heading out of the building for a non-radio job. He’ll be the first Director of Community Outreach for the Cuyahoga County Common Pleas Court. Darren’s last day at Oak Tree will be October 28th. The opening caused by his departure is posted on Clear Channel’s career site. CHANNEL 3 MOVES: We already told you about local TV news veteran Jack Marschall joining the folks at 13th and Lakeside as a freelance reporter. There are other changes at Gannett NBC affiliate WKYC/3 as well. Kristin Anderson rejoins Channel 3 News as a reporter – er, multimedia journalist. Her husband John was recently moved to the station’s “Channel 3 Today” morning show alongside meteorologist/co-host Hollie Strano. I’ve met so many incredible people during my time here. I leave with everyone in my heart! Wiggins most recently produced the Regina Brett Show at WKSU-FM/89.7 FM. And thank you again to long-time Friend of OMW Ann VerWiebe, WKSU’s marketing guru, who told us about Danielle’s new job in a comment we just found and approved. We do owe Ann at least one “Ann’s Corner”, and more. A SLIGHT GHOULARDIFEST MOVE: Yes, local and national TV legend Tim Conway is still coming to this year’s “Ghoulardifest”. But the time on Saturday, November 2nd has changed due to changes in Tim’s travel plans…he’ll be there at 2 PM that day, as opposed to the earlier announced time of 10 AM. The Northeast Ohio native, who was born in Willoughby and grew up in Chagrin Falls, worked alongside “Ghoulardi” himself, Ernie Anderson at then CBS affiliate WJW/8…coming over from then-KYW/3 (today’s WKYC). Conway will be interviewed on-stage by another Northeast Ohio native, Dan O’Shannon, executive producer of ABC’s hit comedy “Modern Family”. The 2013 edition of “Ghoulardifest”, as usual, includes Anderson’s successors at WJW – “Big Chuck” Schodowski, Bob “Hoolihan” Wells (an OMW reader) and “Lil’ John” Rinaldi – and many more. “Ghoulardifest” has moved this year, to the LaVilla Banquet and Conference center at 11500 Brookpark Road. It’ll be held November 1st, 2nd and 3rd. Many more details are here. And it may just be coincidence that as we write this, “McHale’s Navy” is airing on the 8.2 “Antenna TV” subchannel of Tim Conway’s old station, WJW…. CHAD’S BACK ON THE RADIO: Chad Zumock, who was bounced from his gig on Clear Channel rock/talk WMMS/100.7’s “Alan Cox Show” after, uh, off-air problems (search our archives for more), is back on the radio again…at least once a week. The station’s announcement of Zumock’s new hour-long weekly show is here. We believe the Sunday night show will feature selections from Zumock’s podcast, which can also be heard on his website.